Either indoors or outdoors, having a hot tub is the greatest way to relax and soothe aching limbs in your own home. Known for reducing stress, easing muscle pain, and improving circulation a hot tub will give you many, many years of enjoyment. A William Garvey teak hot tub can be made for a single person, or up to six, all beautifully hand made and bespoke. Hot tubs can be provided with a seat to fit the tub, a teak lid to keep in the heat, with powerful jets to get the water pressure onto your body, LED lighting to give you a sense of mood, and can even be Wi-Fi enabled so you can program your features while driving home. We will discuss with you all the engineering that’s necessary as well as the water treatments to keep it healthy when not in use. William Garvey have recently made, installed and realised the concept design with Mark Pinney Architects, for a stunning hot tub in teak with a fully lit 1.3m stainless steel waterfall; hydro massage jets; a jet air system, underwater LED mood lighting and a control system with built in WIFI and apps for both iPhone and Android integration. 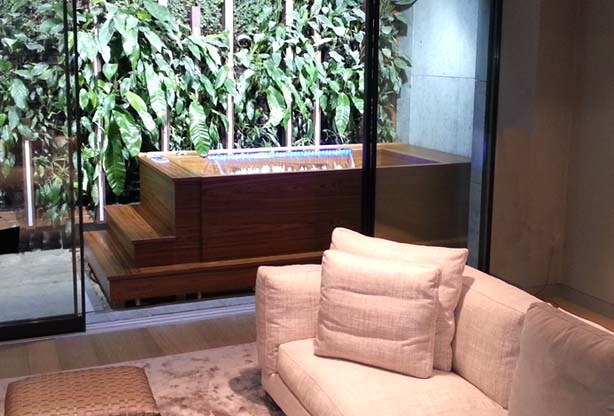 The 2 metre long spa tub, with seating for four had many challenges in manufacture but in partnership with SplashTek the dream has become a beautiful reality.